The Trusts balance currently stands at GBP24652. GBP100 has been set aside for World Cup Sweepstake prize money with GBP41 currently available to put towards future coach trips. GBP1500 has been paid out for community coaching which covers up until the end of January. GBP76.50 has been paid to the winner of last seasons prediction league Phillipa Preece and fees for the website have been paid up to 2016. There has been some response to the reminder e-mails sent out to lapsed members with a couple of renewals and one new member being gained. Leaflets promoting the Trust were given out at the Everton friendly and will continue to be distributed along with booklet versions of the monthly Newsletter. A couple of local businesses have responded with regards to offering discounts to Trust members and this will now be pursued further. The club confirmed that the new floodlights will be in situ sometime in November and says there may be a friendly game to act as an official switch on. Plans and estimates are unknown at this time but Charlie Clapham projected that the overall cost may now be in the low GBP80000s. The Trusts contribution remains at 25% up to GBP100000. With regards to community coaching Haydn Preece says he wishes to present to the Trust and its members the different strands of coaching being offered by the club and will be invited to a meeting in the future to do this. The club also wants the Trust to look into improving disabled facilities. Board members were asked what roles they would like within the Trust and these will be finalised after the AGM. Quotes for next season have been received from Elite Travel and Huyton based Cambreco. Overall Elite are GBP120 cheaper but Cambreco offer cheaper prices for the longer distance trips. This is due to their ability to access smaller vehicles which Elite cannot do. A trial game was suggested using a 24 seater vehicle to see how this would be received by supporters. With regards to the weekend trip Bristol in April is the leading candidate at the moment. Confirmation will be sought shortly that the proposed Meet the Manager session will go ahead. The 18th October and 1st November were put forward as possible dates for the annual Race Night. A quiz night was also discussed possibly taking place sometime in the New Year. The AGM will be held on Tuesday 2nd September. The Trust is keen to get back involved with the Band Nights if they are resurrected by the club. These were very successful previously raising over GBP2000 in just a couple of years. Easysearch is currently raising GBP3 per week for the Trust with the Webshop having raised GBP90 thus far. Katrina has taken over the pledges which raised GBP272 last season. The next match signs will continue next season. Enquiries will be made to Merseyrail regarding increased publicity for the club on trains and at stations etc. The FA’s plans for a ‘League Three’ have been put on the backburner following huge opposition from clubs and Supporters Trusts from around the country. The Trusts balance currently stands at £24,427. A payment of £106 has been made for the continued hosting of the website until May 2016. The Trust has received £16.62 from the Easyfundraising online shopping and search facility to date and the annual return to the Financial Conduct Authority has been signed and submitted. Coaches ran at a net loss of £364 for 13/14 largely due to the £393 subsidy of the coaches to Tamworth on Non-League Day. Subsidies totalling £651 were received from Charlie Clapham to cover losses on trips to Gateshead and Welling. Bill has sent e-mails out to lapsed members. Leaflets will be distributed at some of the home friendlies promoting the Trust. The Trust would like to thank Rob and Julia Urwin for all their hard work after they decided to step down from the board. James Treadwell and Noel Warham have been invited to replace them and will be co-opted onto the board at the Trust’s AGM. Once this has happened each board member will be assigned a specific role within the Trust. A number of possible incentives for members were discussed including discounts in the club shop, an extension of the club’s early bird season ticket deadline and discounts with local businesses. The latter could also be a way to increase the Trust’s profile around the town. The Trust is again disappointed about the lack of communication from the club especially with regards to the floodlights project. No estimates have been received and no plans have been seen and a meeting with the club is still being sought to clarify these matters. There has also still been no feedback regarding the primary school coaching. Quotes have been obtained from Cambraco Travel which includes the cost of hiring a minibus to matches. Other local companies will be canvassed and it was pointed out that the same company doesn’t have to be used all season. From next season junior prices will be 50% of the full adult price rather than a third. The weekend away will hopefully take place in either March or April depending on fixtures. The World Cup sweepstake is underway and the Trust would like to thank Alan Jones once again for his superb artwork. Tilly the TIY Teddy now has a Twitter account and is currently in the USA as she begins her globetrotting. The easyfundraising scheme will be promoted at the friendlies in the hope that more supporters will sign up. The Trust would like a player to liaise with next season with regards to promoting events to the players such as the Race Night etc. The AGM will probably take place towards the end of August with 2 weeks notice needing to be provided. Alan Scarisbrick and Katrina Taylor are the board members up for re-election. The Trust will sponsor a player again next season. The Player of The Month award will continue in the same format with younger supporters making the presentations. The minutes of tonight's meeting will be online within the next couple of days. Southport supporter Andrew Bostwick has been named the first Trust in Yellow Fan of the Season. 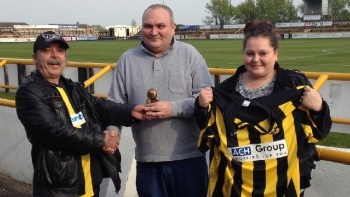 Andrew, who is an ever-present at the Merseyrail Community Stadium this season and a regular at the Sandgrounders’ away games, was announced as the award-winner at the final home match of the season against FC Halifax Town on Monday. He was presented with a signed home shirt and a trophy having been nominated by his daughter Sophie. “My dad has brought me up from a young age coming to watch Southport and hardly ever misses a game,” said Sophie. "He works seven days a week but always makes time and space so he can come and watch Southport. The club means so much to him and works very hard to get to the matches. “He always goes to away games and will find transport to get there to see his favourite players. “My dad has always been by my side and no matter what he will make time to go and watch Southport play. Andrew is pictured receiving his award from Trust chairman Alan Scarisbrick and daughter Sophie. The Trust introduced the award this season as a way of recognising an unsung hero and a fan who demonstrates the sort of passion that sums up what it means to follow Southport. The Trust would like to thank everyone who made a nomination for this season’s award and entries will open again at the start of the next campaign. The Trusts balance currently stands at GBP24439. A payment of GBP1500 has been made to the club for primary school coaching and next match signs have cost a total of GBP600 this season. A cheque for GBP200 is expected from The Champion shortly for the use of Julias photos and the six month fixed rate deposit of GBP15000 has now matured gaining GBP130 interest. Coaches have run at a net loss of GBP411 thus far although most of this was down to the heavily subsidised Tamworth trip back in September. Membership is hovering at around the 200 mark with not much activity expected at this time of year. E-mails will be sent out to those who havnt renewed and the possibility of increasing the Trust’s presence at either the first home match of next season or at a high profile friendly was discussed. It is hoped the completion of the floodlight project in the summer will encourage both potential and lapsed members to sign up. The Football Stadia Improvement Fund will be meeting on 23rd April where the application for a grant for the new floodlights will be discussed. It was agreed that the Trust must review its expenditure following the completion of this project and then seek a meeting with the club before deciding on any definite future projects. The coach to Gateshead was filled yet there were only 3 people on the standby list at the time of this meeting despite the bargain GBP10 price for members following Charlie Claphams generous subsidy. Arrangements for Welling will be dependent on results from over the Easter weekend so an announcement will be made after then. The end of season awards have been put on the backburner due to the clubs current predicament on the pitch. The Fan Of The Season award however will be presented at half time on Easter Monday. Around GBP40 has been raised from Easysearch so far with some of this being carried over from the old webshop. The Easysearch engine is raising around GBP2 per week at the moment and its earning potential is shown by the fact that Chesters supporters trust has raised over GBP3000 in the last 2 years solely from searches made on Easysearch by their supporters. Rob will wear a Liverpool shirt at the first home game of next season if GBP1000 is raised. The Trust has received a generous donation of 25 yellow footballs from Alan Drury. It was suggested that these could be signed and used for competitions etc.